Buy the Farm . . . Share: Con-GRAD-ulations! Thursday began, as most days do, quite early. On this trip the Wombats have decided that their new favorite thing to do is wake up around 5:00 in the morning, monkey around for a bit, have a bottle, then go back to sleep until about 7:00. I suppose we should be grateful that they do go back to sleep but I think I'd prefer them sleeping through and eliminating the nap after being awake for thirty minutes. Given the intense disruption we've given their routine on this trip I suppose we should be grateful. They decided that standing around their grandma's wicker table and banging it as hard as they can was their new favorite morning activity, much to the delight of those in the house that were still asleep. Thursday I was tasked with making dinner for Lauren's birthday and pending graduation. We all piled in the car and went to the grocery store. This meant that Jen had to sit in the back between the two car seats. 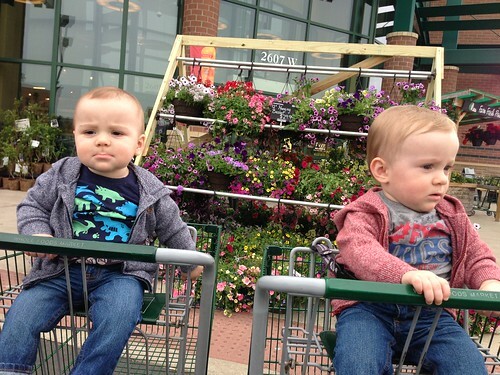 As with everything in life now a simple trip to the grocery store became a test of endurance, patience, and pure parenting prowess. We ended up buying a bunch of stuff we didn't really want or need. It's just that after letting the guys play with, smack, and slobber all over so many items to entertain themselves we felt obliged to purchase. Now we have a bag of tortilla chips, a honeydew, and a rubber ball. 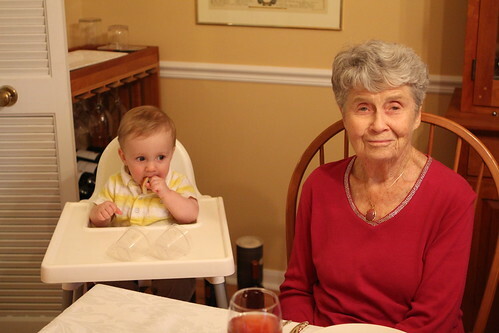 After we arrived home Nana had gotten in from Canada and she was delighted to see the boys not having seen them since there were only two months old. After an extremely late lunch I got to work on grilling up some vegetables while Jen's father mowed the lawn. 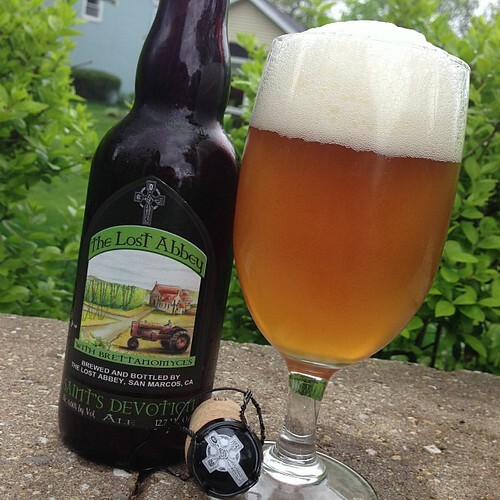 I also pretended it wasn't drizzling by cracking open this Saint's Devotion from The Lost Abbey. There was a lot of warning about this beer as it is brewed with brettanomyces. Warnings were of "funk" and other unpleasant sensations. I've always found brettanomyces to be delightful so I was happy to find this one at the local grocery store. It may be a little fancier than your normal grilling or lawnmower beer but, I'm an insufferable jerk so I found it delightful. 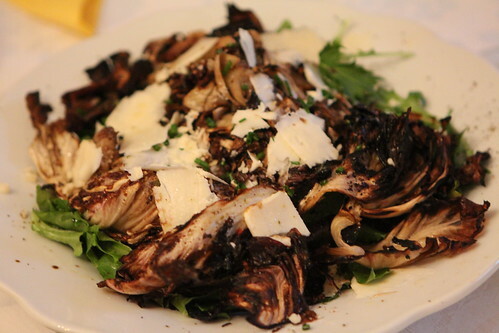 For dinner I grilled up raddichio and made a salad with balsamic vinegar, olive oil, and aged cheddar. 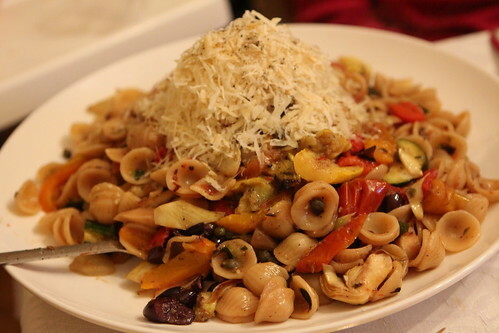 Also I grilled zucchini, summer squash, bell peppers, and fennel, then added them to cooked orecchiette, roasted red tomatoes, chopped black olives, capers, and grated Parmigiano-Reggiano. 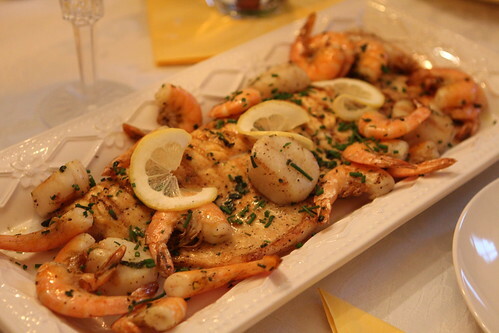 To accompany this I grilled up some lake trout, sea scallops, and shrimp with a little olive oil, salt, ppeper, and fresh chives from the garden. 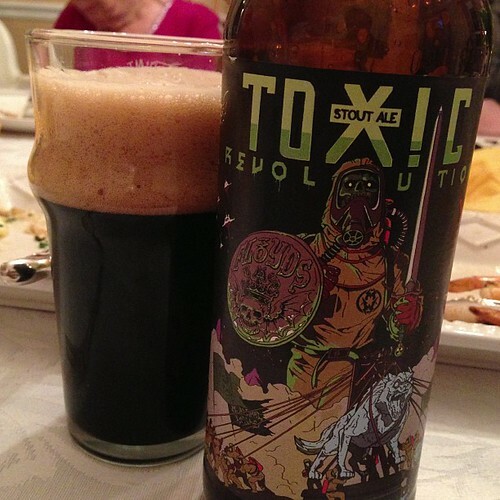 By brother-in-law and I both brought Three Floyds beers to the dinner and shared both bottles. With dinner we started with this Permanent Funeral, a beer they brewed in collaboration with the band Pig Destroyer. After dinner we had this Toxic Revolution, another collaboration this time with the band Municipal Waste. At first I thought that they'd done the collaboration with the local government agency until I found out that this was yet another heavy metal band I've never heard of. 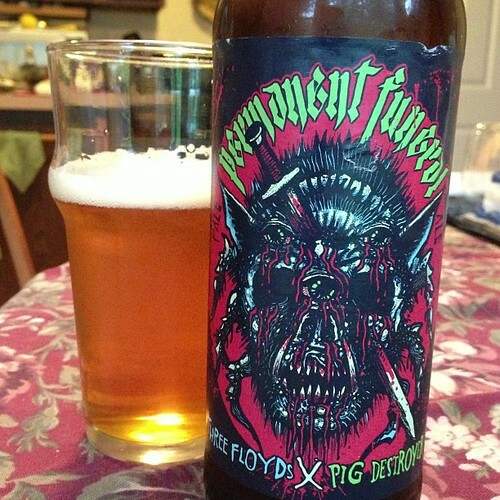 As long as there are obscure, comical, gruesomely named heavy metal bands Three Floyds will have an excuse to continue making delicious beers. It's a weird symbiosis but it works. Friday morning we awoke and went to visit Amanda and her boys once again. They had a great time playing with the older boys. 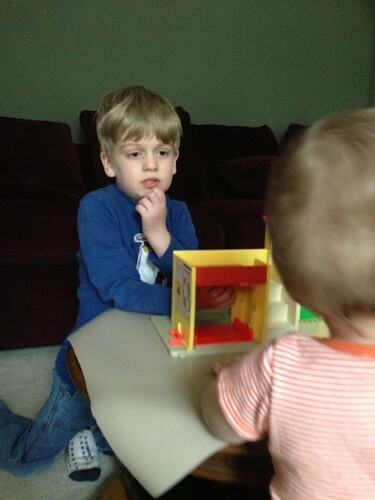 They even had lunch together and played with an awesome Sesame Street toy from the 70s. Matthew was kind enough to allow Elliott to smack and poke at his face too. In fact, he seemed to enjoy it. 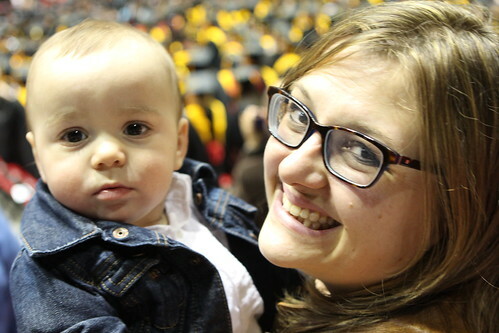 The evening was reserved for Auntie Lauren's graduation. 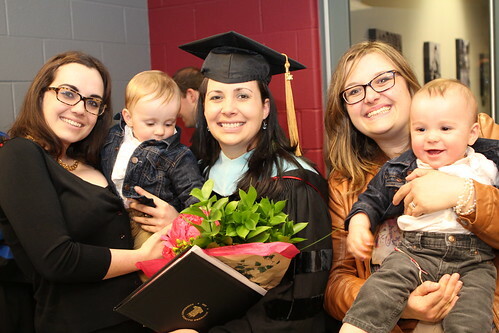 They will now need to refer to her as Dr. Auntie Lauren. She didn't spend seven years in the educational doctorate program to just be called Auntie Lauren. It was a risky evening as the boys were completely thrown off their schedule for the entire day. They had minimal naps and had almost all of their meals early or late. Even with all of that stacked against them -- and, let's face it, against us -- they managed to keep it together. 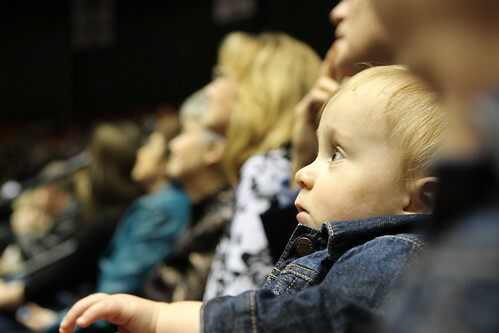 Luckily there were so many crazy sights and sounds at the graduation that they were continually entertained. Toward they end we did need to use a carefully deployed stream of puffs to keep them at bay. The drive home was not pretty but after making it through the graduation with nothing but praise from all and sundry we were just happy to be alive. 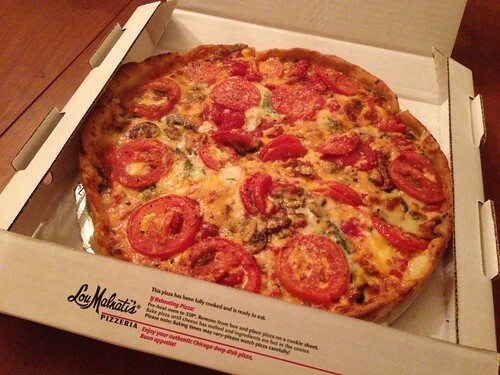 In fear of leaving the Chicagoland area without having deep dish pizza we ordered some late night delivery from Lou Malnati's, voted the pizzeria that most sounds like a secret society responsible for masterminding world events. Despite the fact that we would have been happy eating from the trash given how hungry we were, the pizza was fantastic. 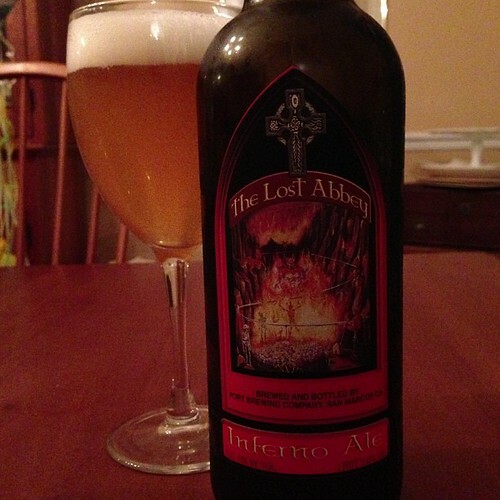 After getting home so late, coaxing the babies to sleep, and getting pizza delivery we were in need of a beer so I opened another from The Lost Abbey, this Inferno Ale. It was a beautiful golden ale from a brewery we have no access to back home. If you're in the Chicago area I'd highly recommend this combination. Even if garbage and Miller Lite would suffice. I'm sorry, was that redundant?